One of the biggest passenger ships ever built - the Queen Mary 2 - has made its maiden visit to Liverpool. 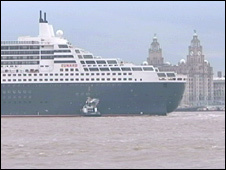 The Cunard vessel, the 15th liner to call at the cruise liner terminal in 2009, is the largest liner ever to sail up the Mersey. The ship is in the city as part of its fifth birthday UK tour and will spend about 10 hours berthed in the terminal. Cunard was founded in Liverpool in 1839 and had its main offices in the city for almost 130 years. Its flagship vessel weighs 151,400 tonnes and is the most expensive ocean liner ever built. The Queen Mary 2 arrived on the Mersey at about 1130 BST and was due to leave at 2300 BST after a fireworks display. Councillor Warren Bradley, leader of Liverpool City Council, said it was a "historic" day for the city. Peter Shanks, president of Cunard Line, said: "It's a hugely proud day for all of us at Cunard Line to bring the Queen Mary up the Mersey to her spiritual home of Liverpool. "It's a truly wonderful opportunity."